A VM can have a maximum of 30 category/value pairs. From the environment details page, click VMs: Settings. The VM Settings page displays. 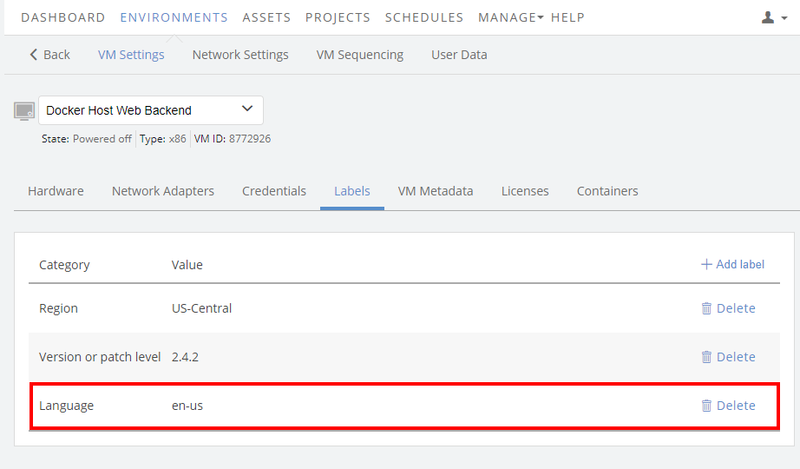 On the VM Settings page, click the Labels tab. From the Add a label drop-down menu, choose a label category. Type a value for the label. For example, if you wanted to label a VM with its OS license number, you could select License and then type the license key. Although you can add labels to individual VMs, they aren’t used in reports. Only multi value label categories can be used on VMs. Click next to the label you want to remove. A confirmation dialog displays. Use the REST API to add and remove labels for assets. For more information, see Asset labels v2 resource. Use the REST API to add and remove labels for schedules. For more information, see Schedule labels v2 resource.